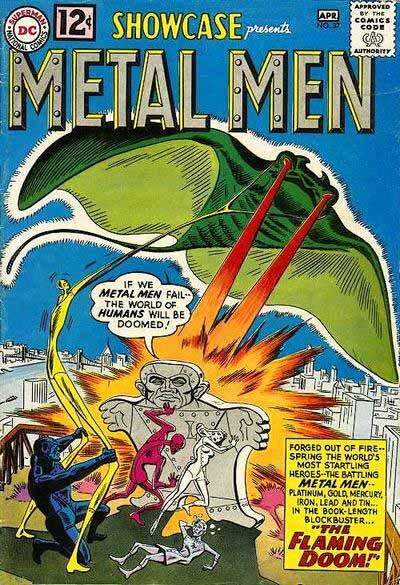 The METAL MEN first appeared in four consecutive issues of DC’s SHOWCASE in 1962, beginning with issue 37, above. 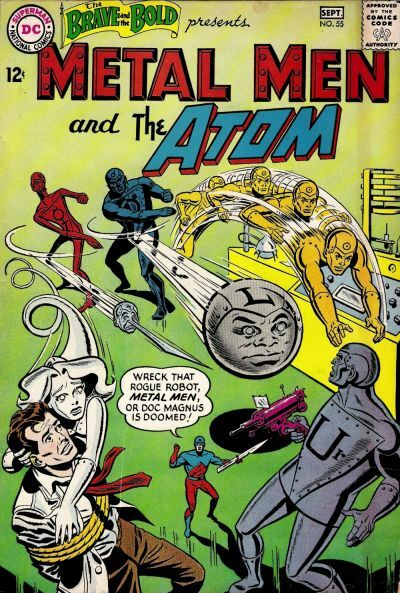 Legend has it that the book needed a quick fill-in and writer Robert Kanigher created the characters and wrote the first issue over a weekend, then artists Ross Andru and Mike Esposito rushed through the artwork in a week. For such a slapdash origin, the books were a big hit, spawning a pretty long run in their own title. 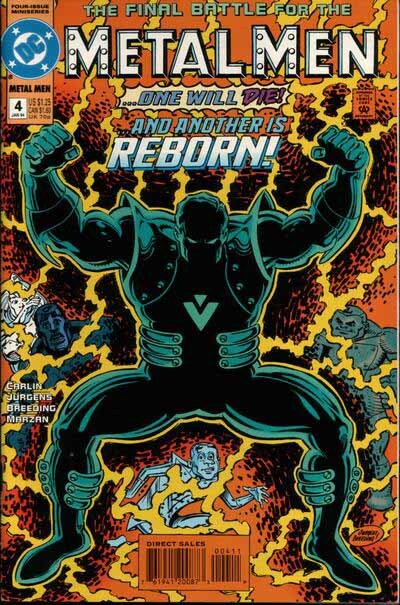 I liked the characters and the comic from the first one I saw, and I think it’s my favorite Kanigher creation. To make these letters work well, especially on the ones with angled strokes, the proportions of the inner shape, here shaded blue, have to be carefully worked out. As you can see, Ira made the angled strokes a little thinner than the vertical ones. This allowed the outer shape of the letter to still have correct proportions, not look too thick around those angled strokes. The angle also had to be just right, so that the M would not look too wide compared to the rest. Similar decisions were made for the A and the N. But this was all old hat to Ira, who had been classically trained many years before, and knew his letter proportions very well. While they were running in their own title, the characters also appeared in other DC comics like THE BRAVE AND THE BOLD, as seen here in issue 55 from 1964. 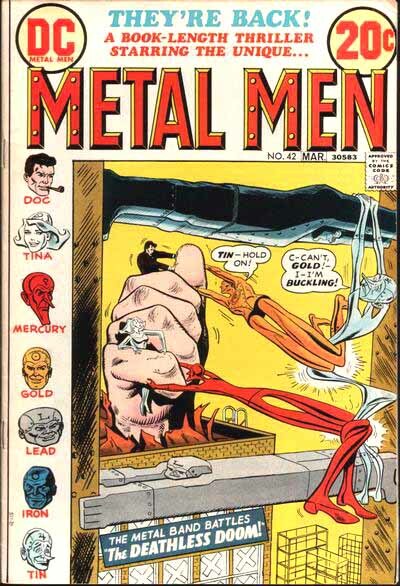 BRAVE AND BOLD was essentially a team-up title by this time, and often the logos from the regular titles of the characters were used unchanged, but in this case Ira Schnapp redrew the Metal Men logo in a much less tall version. I can be absolutely sure of this because here’s the original Schnapp logo from this very issue, which I found in the DC files. While I like the taller one better, this version does allow for more room on the cover when paired with another logo, as it was here. Clearly Schnapp’s logo for The Atom was a pasted-on photostat which has fallen off in the years since. One thing that jumped out at me when seeing this was the clever use of white lines in the bottom right corner of each bevel to keep it looking three dimensional. Wish I’d thought of that when I did beveled logos! One flaw of this design is the narrowness of the horizontal stroke on the A, but Schnapp must have felt making the central opening smaller wouldn’t have looked good, so opted for that compromise. 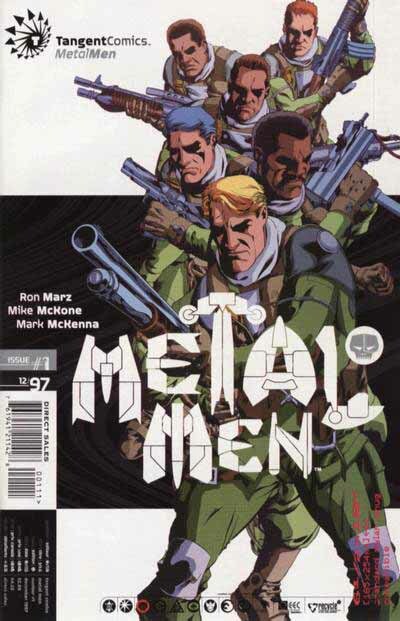 METAL MEN in their own title ran 41 issues, was cancelled, then revived for 15 more issues, all using the original logo. That brought the book up to 1978, after which the characters appeared rarely for some years. Not something you could use more than once, really, but what a great idea, and beautifully drawn! Hats off to penciller Dan Jurgens and inker Brett Breeding. 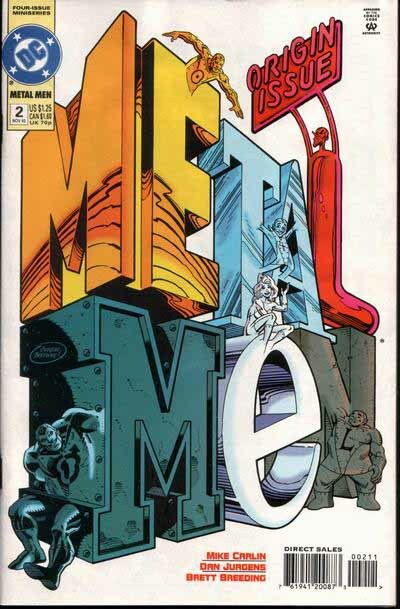 Notice how each letter expresses the personality and metallic tendencies of the characters, yet it all works together. Part of the Tangent line of alternate versions of DC characters, this one from 1997 is about something completely different, just thought I’d add it here, as we don’t have that many different logos to look at. The logo, and entire cover design is by Rian Hughes, and shows his usual flair for eye-catching graphics, though I have to say I find the logo a little hard to read. Still, it’s a one-shot, and meant to be experimental, and it’s certainly original. That brings us to this very recent relaunch of the characters in a new series written and drawn by Duncan Rouleau, sporting a very stylish new logo by Josh Beatman, designer of the new DC symbol. I like his idea of using upper and lower case letters on a slant, and the way they fit together in the center is quite attractive. As a nod to the original, he’s added a few rivets on the M’s. The surrounding rounded outline shows metallic shine and highlights of the sort that are usually done in Adobe Photoshop, but these are subtle enough to avoid being distracting, and look fine to me. In all, a very nice job, and I think it complements the somewhat cartoony art perfectly. Did you notice that the characters are forming a huge number 1? Of course you did. Very clever. I like the sense of humor, and the cogwheel design up the sides is attractive (though I don’t know what cogs have to do with the characters). I hadn’t planned on reading the comic, but after studying the cover, I’m intrigued enough to do that now. Guess you can’t ask much more of a cover than that. 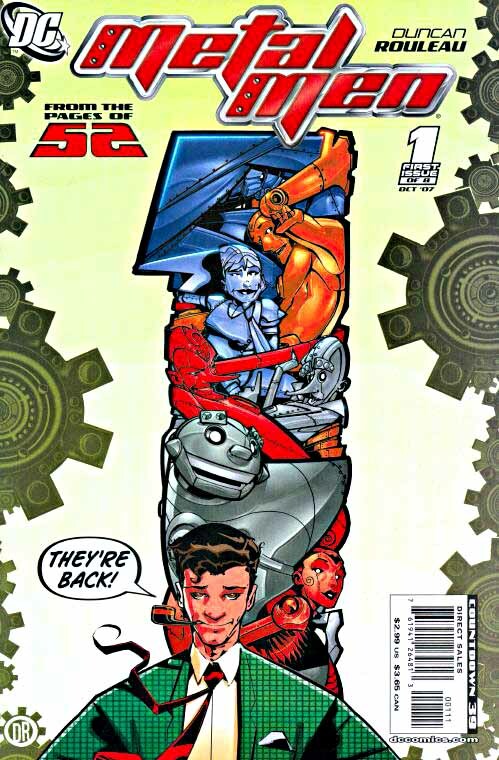 And it seems each issue of this series has the characters creating a giant number in the same way. Interesting. Other logo studies are on my LOGO LINKS page. This entry was posted in Logo Studies on September 26, 2007 by Todd. The cogs are part of the redesign of the Responsometers, which have cog looking parts in the flashbacks. Thanks, Erik, if I’d read the book before posting, I would have known that, huh? Another awesome logo investigation. I swear, two weeks ago I couldn’t have cared less about any comic’s logo (or wasn’t aware of the level on which they were affecting me, rather), but now I can only look at them and wonder how they came to be that way. Keep it up! Ford pointed me this way as a Metal Fan; I wasn’t aware of your logo studies, but it is a pretty interesting concept, & I found this one entertaining. Thanks for the logo blogs. I’ve been reading, collecting, selling, regretting, and buying more comics for 48 years. It’s wonderful to learn these behind-the-scenes revelations about cover design and logos and “the why” of things. Thanks. 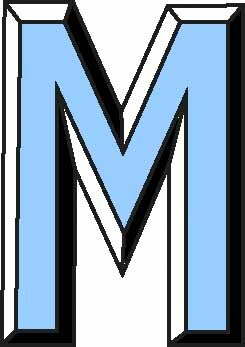 However, I’m really writing to compliment your parents, teachers, or whomever is responsible for your commentary about the Tangent MM logo; “Interesting”. As we’ve all been taught at some point, “If you don’t have anything nice to say … ” Congrats on making the best out of a bad situation. Well done.